The newly elected Burmese civilian government is desperate to appear to the outside world as a fledgling democracy intent on building a civil society. But ‘good-feel’ statements made by elected government ministers at a Karen training course did little to convince, as the Burma army continues its strategy of militarization in Eastern Burma by displacing Karen hundreds of villagers in the region. Karen State officials earlier this month called on young people to carry the mantle of literary and cultural traditions to future generations during the closing ceremony of the 41st Karen State Literature and Culture training workshop in Kawkreik Township’s Yan Koat village. 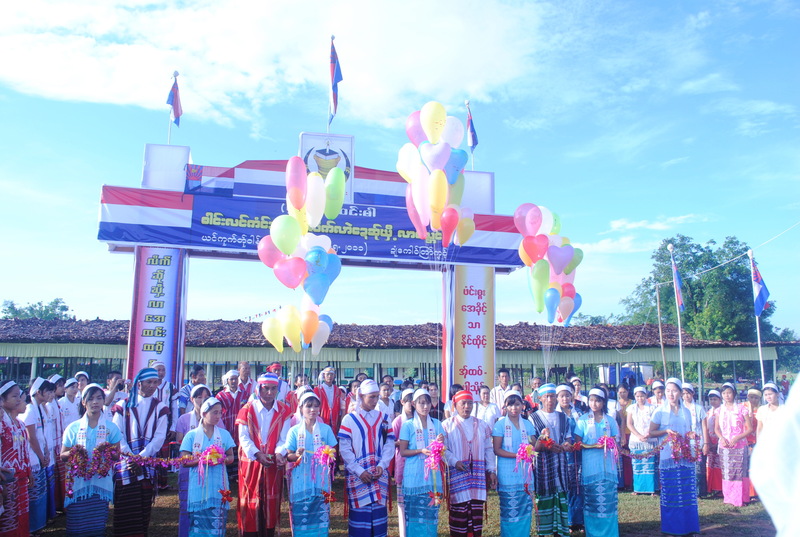 More than 1,000 people from over a hundred villages throughout Karen State, including state ministers, members of parliament and other community leaders, participated in the closing ceremony on May 9. Among the newly elected dignitaries in attendance were Mining Minister U Saw San Law Hla, Forestry Minister U Saw Kyi Lin, Transportation and Communications Minister U Saw Khin Maung Myint, among several others. Hluttaw [state parliament] Chairman U Aung Kyaw Min, Pa’O Nationalities Minister U Khun Than Myint and National Affairs Committee Chairman U Khon Min also attended the closing ceremony. The newly elected Major General Zaw Min, the premier of Karen State, was unable to attend the ceremony, but submitted a letter read to be read to assembled dignitaries and participants. “Karen people and other ethnic nationalities living in Karen State have now eaten of the fruit of peace. Every nationality has the freedom to maintain their literature and culture, but we must be careful that the freedom of one group does not hurt the freedom of other groups,” Zaw Min said in the letter. U Saw Thein Aung, nominated during the second meeting of parliament as a candidate for vice president of Burma, addressed graduates of the literature and culture training following the reading of Zaw Min’s letter. He told the graduates that though Karen and other nationalities had begun to partake of the fruits of peace, many others still suffered. “Fighting still continues. Many still run and hide and are killed. So we still have hard work ahead to stop these things. It is not enough to maintain our literature and culture. We must promote these things and make them the responsibility of every Karen,” U Saw Thein Aung said. In spite of the Burma army operations against ethnic people committee representatives said the next training workshop would be held next year in Shwe Kaukko village in Myawaddy Township.